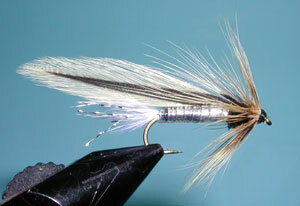 Notes: The Light Spruce is a featherwing streamer that can be tied in the more common "Light" version using Badger hackles or the "Dark" version using Furnace hackles. The fly was designed by Bert and Milo Godfrey of Oregon around 1918, while on a fishing trip on the upper Lewis and Clark River of Northeastern Oregon. The original Spruce Fly used a Badger saddle hackle for the wings, Badger neck hackle, Peacock Herl for the body with a rear tag of red wool, and four strands of Peacock sword for the tail. An excellent streamer pattern for Sierran streams. 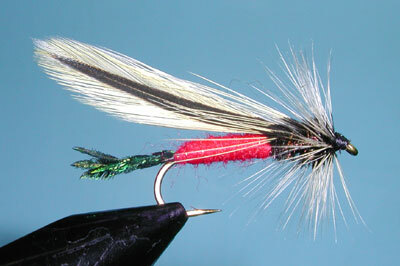 The predominant center stripe of the wing gives the fly the look of a baitfish. This pattern has also been modified for sea-run Cutthroats and Steelhead by tying florescent orange yarn onto a salmon hook. 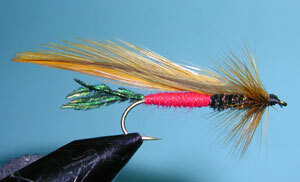 The streamer is usually tied with a TMC 300, a 6XL long shank. Within our smaller Sierran streams, you may find the smaller TMC 5263 a better size. Charles Waterman of Montana came up with a very nice variation, the Silver Spruce, using Silver Tinsel and a Clear overbody using clear D-rib or large monofilament. 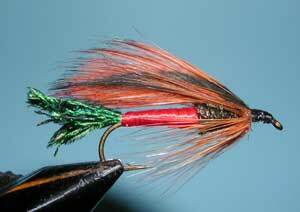 This has been popular for imitating minnows and sculpins. Also, try using a variation with the Golden Spruce, particularly at Lake Crowley when the Perch Fry are active in the Fall.